The Geology of Santorini Greece, Cyclades: The island of Santorini, popularly referred to as Thera, is located at the extreme southernmost part of Cyclades islands, Greece. Santorini is a unique island in the Mediterranean Sea, as it is the place of several remarkable volcanic explosions that have erupted here over the past thousands of years. 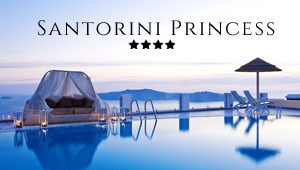 In a way, Santorini is a massive lagoon, which is conspicuous by its rectangular shape and measures around 12km by 7km. On three sides this lagoon is encircled by 300 meters high precipices or rocky promontories. The island of Santorini slants downhill from the high cliffs to the Aegean Sea. There is also a comparatively smaller island, Thirassia, that forms the boundary of Santorini lagoon. In the beginning, about two million years ago, Santorini used to be a small non-volcanic island. Mount Profitis Ilias, located to the southeastern part of Santorini, bears testimony to this fact as its non-volcanic limestone would suggest. Scientists are of the opinion that about two million years ago, volcanoes located underneath the Aegean Sea to the west of Santorini began generating volcanic emissions that resulted in the formation of numerous small islands and ultimately there came into being two colossal shield volcanoes, which are nothing but conical shaped mountains. These conical mountains got amalgamated with the non-volcanic islands to make way for one large-sized island, which is Santorini. Although there is absolutely no trace of these mountains in the present times, geological scientists have appropriately named them. The mountain to the north was named as Mount Peristeria, while the one located to the south was named Mount Thera. Geologists are of the opinion that 200,000 years ago Mount Thera began to release immeasurable quantities of volcanic emission and they got deposited in the form of a chamber under Mount Thera. So massive were the eruptions that the mountain was unable to sustain itself and it collapsed downwards into the vacant volcanic chamber, thereby forming a caldera, which is nothing but an extensive yawning hole at the basement. This explosive phenomenon of Santorini volcano has been occurring continuously for the next 200,000 years and each time an explosion occurred, it would further deepen the caldera, which ultimately shaped the island of Santorini as it is today. The island of Santorini is made up of the following islands: the main island Thera, Therasia, Aspronisi, Palea Kameni and the island of Nea Kameni (or the volcano as it called by the locals). The volcanic zone of Santorini is the most dynamic volcanic zone in the South Aegean Volcanic Arc. The volcanic arc of Santorini is approximately 500 km long and it extends all the way from the Greek mainland to the Turkish Bodrum peninsula. The Santorini Volcanic Arch is exemplified by seismic activity at depths ranging between 150-170 km, which also happens to be the point where the African Plate is positioned beneath the Eurasian plate.